In any conversation about the top footballing nations of the world, Italy is bound to be mentioned more than a few times. With four World Cup titles, Italy is tied with Germany and second only to Brazil (five) as the most successful tournament participant of all time. They’ve also won the Olympic football tournament in 1936 and the European Championship in 1968. They’re known by the name of Azzurri and for their traditional blue kits. 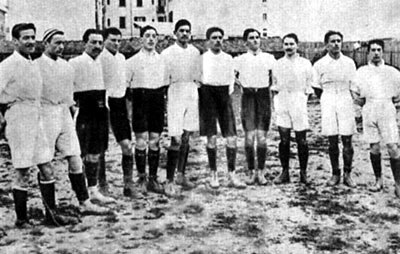 The team that played the first game for Italy in 1910. Shortly after being founded in 1910, Italy organized its first official match with France. They won 6-2 in front of approximately 4,000 spectators at Arena Civica, with Pietro Lana scoring the first goal. Pleased with the performance, the team’s fans rewarded the players by throwing them cigarette packets. This was one of only two games that Italy would play in white kits; next year, they switched to blue jerseys inspired by the royal House of Savoy crest on the national flag. The team’s first notable success arrived in 1928, when they placed third in the Summer Olympics football tournament. Eight years later, they would go a step further by winning the competition, beating Austria 2-1 in the final match. In between these two appearances, they won the Central European International Cup on two occasions. They were also invited to the inaugural World Cup in 1930, but they declined to participate. The year 1934 saw Italy host a World Cup, making their first appearance in the competition. This squad was led by the legendary Giuseppe Meazza, arguably the greatest Italian player of all time. Known as “Il Genio” by the Italian press, Meazza was a prolific goalscorer and a virtuoso with the ball. The team was coached by Vittorio Pozzo, who popularized a 2-3-2-3 formation with two half-backs and inside-forwards. After routing the United States 7-1 in their first match in World Cup history, Italy was set to play Spain. The game ended in a 1-1 draw, with various controversial decisions favoring the home team. In the replay match, Italy defeated Spain 1-0 on a Meazza winner. They then beat Austria 1-0 in the semi-finals and Czechoslovakia 2-1 in the finals, winning the World Cup title in their debut appearance. Meazza was voted player of the tournament. Italian players before a match in 1934 World Cup. Due to the addition of the talented young striker Silvio Piola, many pundits believed that the Italian squad at the 1938 World Cup was even stronger than the previous one. Italy proved them right by beating Norway, France, Brazil, and Hungary on its way to the second consecutive World Cup title. According to rumors, Italian fascist Prime Minister Mussolini sent the team a telegram before the finals that said, “Win or die!” However, this was never proven. Due to WWII, the 1938 World Cup turned out to be the last major tournament in 12 years. One year before official national competitions would resume, however, Italy was struck by a terrible disaster. Namely, the entire Torino football team lost their lives in the infamous Superga air disaster. This had a severe impact on Italy, as the Torino players were the lynchpin of the national team. Following this accident, the team started traveling by boat. The following period saw the Azzurri struggle to establish their previous dominance. After failing to advance from the group stage at the 1950 and 1954 World Cups, they missed the 1958 edition of the tournament altogether. The 1962 and 1966 World Cups saw Italy return with more talented teams, but they were again knocked out in the group stage. The team also missed out on the first two European Championships in 1960 and 1964. Italy finally broke out of this slump in 1968, at their first European Championship. After making their way through the qualifiers, Italy was chosen to host the final tournament. Their semi-final match with the Soviet Union ended in a 0-0 draw, which saw Italy advance on a coin toss. 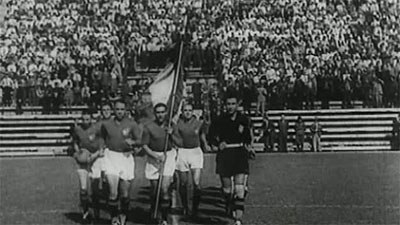 The match against Yugoslavia in the finals also concluded in a draw, but Italy won the replay 2-0, claiming their first major trophy in 30 years. The team carried this good form to the 1970 World Cup. Led by talented offensive players such as Gianni Rivera and Luigi Riva, Italy made it all the way to the finals, where they were defeated by Brazil 1-4. Their most memorable match in the tournament was the semi-final against West Germany, which became known as the “Game of the Century.” Italy won the game 4-3, with 5 of 7 goals coming in extra time and Rivera scoring the late winner. The 1974 World Cup was far less successful for the Azzurri, as they bowed out in the group stage after a shock loss to Poland in the final round. They also failed to qualify for either of the European Championships in 1972 and 1976, which caused a lot of murmur in the Italian press. Nonetheless, the future seemed bright thanks to the arrival of a talented new generation of Italian players led by star striker Paolo Rossi. Their first opportunity to establish themselves came at the 1978 World Cup, where they won all three games in the group stage. Most notably, they were the only team to defeat hosts and eventual champions Argentina. However, a loss in the second round against the Netherlands spelled the end to their title aspirations, with goalkeeper Dino Zoff receiving most of the blame for getting beaten by a 30-yard shot. In the third-place match, Italy was defeated by Brazil. Two years later, Italy would host their second European Championship. This time around, the final tournament consisted of eight teams, which were separated into two groups. After winning the match against England and drawing against Spain and Belgium, Italy finished in second place and qualified for the third-place match. They then lost to Czechoslovakia in a high-scoring 9-8 penalty shootout, with Fulvio Collovati missing the decisive penalty. The preparations for the 1982 World Cup were plagued by the Totonero match-fixing scandal, which saw numerous players -- including Rossi -- get suspended from the Italian league. However, Rossi returned to the national team just in time to take part at the World Cup, which proved to be a huge boost to the team’s fortunes. Still, their group stage matches left something to be desired, as they advanced with three consecutive draws. The Azzurri then imposed a press black-out, which seemed to improve the team’s spirits. In the second round, they won against Argentina (2-1) and Brazil (3-2), with Rossi scoring a hat-trick in the latter match. He followed that up with a brace in the semi-final match against Poland, leading Italy to the finals against West Germany. They won the match 3-1, claiming their third World Cup title. Unsurprisingly, Rossi won both the Golden Ball and the Golden Boot. After failing to qualify for the Euro 1984, Italy entered the 1986 World Cup with lowered expectations. This pessimistic approach was not without merit, as they were knocked out by France in the round of 16. This uninspiring showing led to a renewed interest in young talent, and players such as Paolo Maldini, Roberto Baggio, and Gianluca Vialli were all introduced to the national team within the next two years. This new squad made its debut at the Euro 1988, where they were drawn into a tough group containing West Germany, Spain, and Denmark. Italy proceeded to hold its own, drawing 1-1 with West Germany and winning the remaining two games. These results saw them advance to the semi-finals, but the experienced Soviet Union squad was too tough to overcome. In a closely contested match, Italy lost 0-2. In 1990, Italy got to host its second World Cup. Contrary to expectations, the biggest star of this Italian team ended up being Salvatore Schillaci. Despite being used as a substitute at first, Schillaci went on to score a goal in 6 out of 7 games he played, for which he was voted player of the tournament. Italy made it to the semi-finals, where they were knocked out by Argentina in a penalty shootout. They then beat England 2-1 in the third-place match. Despite missing out on the Euro 1992, most pundits held Italy in high regard prior to the 1994 World Cup. By this point, Roberto Baggio fully came into his own as one of the best players in the world, and many felt that this would be his tournament. However, Italy underperformed in the group stage, losing the opener against Ireland and barely making it to the knockout round. Baggio himself was unrecognizable, and most of the public blame was directed at him. In a twist of events, though, Baggio and Italy rediscovered their form in the knockout stages. They went on to beat Nigeria, Spain, and Bulgaria on the way to the finals, with Baggio scoring five goals during that stretch. He also picked up a hamstring injury, however, which caused him to play with painkillers in the final match against Brazil. The game eventually went to penalties, with Baggio missing the decisive penalty and gifting Brazil the title. By comparison, the following two major tournaments were disappointing affairs for Italy. At the Euro 1996, they didn’t manage to advance from a group that contained eventual finalists Germany and the Czech Republic. The 1998 World Cup saw them make the quarter-finals, but they lost to France in a penalty shootout. Similarly to the previous showing, their opponents went on to win the whole tournament. The Euro 2000 saw Italy bring a strong squad that included rising star Francesco Totti and established big names such as Alessandro Del Piero and Filippo “Pippo” Inzaghi. After recording all three victories in their group, they beat Romania and the Netherlands on their way to a rematch with France in the finals. Despite Italy holding a 1-0 lead for most of the second half, France equalized in injury time and won on a golden goal from Trezeguet. This heartbreaking loss turned out to be a tough pill to swallow for the Azzurri, as they went straight back to mediocrity. The 2002 World Cup saw them get knocked out by hosts South Korea in the round of 16, despite being overwhelming favorites to win. At the Euro 2004, they didn’t advance from the group despite accruing 5 points from 3 games. In a 3-way tie to advance, Sweden and Denmark went through on goal difference. Following this slump, the Italian Football Federation appointed Marcello Lippi as the new manager. His debut game in charge against Iceland ended in a shocking 0-2 loss, but he still managed to secure a spot at the 2006 World Cup. By the time the group stages rolled around, Italy was performing like a well-oiled machine. With two victories over Ghana and the Czech Republic and a draw against the United States, they had little trouble advancing from the group. The knockout stages saw Italy continue to perform well, especially on the defensive end. They defeated Australia, Ukraine, and Germany without conceding a goal, setting up another final match game with France. This time around, the finals were shrouded in controversy. The game ended 1-1 and went to penalties, but not before Zinedine Zidane was sent off for headbutting Marco Materazzi. Italy won the penalty shootout, claiming its 4th World Cup title. Following this achievement, Italy started struggling to return to its winning ways. They went out in the first round at both the 2010 and 2014 World Cup and missed out on the 2018 World Cup altogether. Their appearances at the European Championships were a bit more inspiring, though. Both the 2008 and the 2014 edition of the Euro saw the Azzurri make the quarter-finals, but they were knocked out on penalties on both occasions. Their most successful showing during this period arrived at the Euro 2012. After escaping a tough group containing Spain and Croatia, Italy defeated England on penalties. They followed it up by beating Germany 2-0 in the semi-finals, with Mario Balotelli scoring both goals. The final match against Spain was quite anticlimactic, though, as their opponents took an early lead and controlled the game on the way to a 4-0 rout. 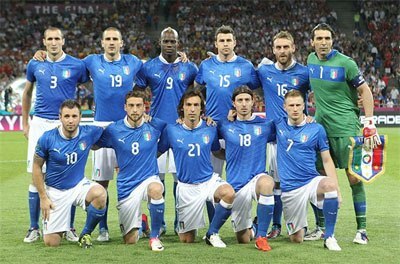 Italy starting XI in Euro 2012 final. Italy has participated 18 times in the World Cup. Italy have participated 9 times in the European Championship (Euro). The logo features a crest with “Italia” in letters and the Italian flag below. In small letters between “Italia” and the flag, “FIGC” is visible, an abbreviation for Federazione Italiana Giuoco Calcio (Italian Football Association). The stars symbolize the four World Cup victories.